The MSI-8000 is a wireless remote display for viewing and control of any RF compatible rice lake weighing systems which inclide MSI-3460 Challenger 3 or MSI-4260 Port-A-Weigh overhead crane scale, or MSI-7300 Dyna-Link 2 tension dynamometer. Just one MSI-8000 communicates wirelessly with up to four compatible MSI devices. Compact and portable, the MSI-8000’s heavy-duty NEMA 4/IP65 industrial-grade enclosure makes it ideal for use in nearly any operating environment. 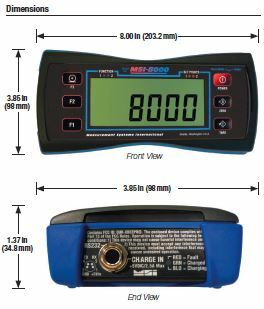 The MSI-8000 features a large five-digit 1.25 inch (31 mm) LCD display for improved visibility, and a user-friendly keypad for simple configuration and operation. Standard function keys include: Power, Zero, and Tare and three programmable keys for functions like Peak Hold, Totalizing, Unit Select, Print and Set points. The MSI-8000 operates on a license-free 2.4 GHz frequency with a typical application range exceeding 100 feet (33 m). Power is supplied by an internal rechargeable lithium polymer battery, which provides up to 24 hours continuous use between charging. An integrated RS-232 data port allows the MSI-8000 to easily interface with peripheral devices such as printers, PCs and scoreboards.